I’m happy with the sample Bayou 135s I bought so I got a bunch more. At this rate, it will get me through summer and then I’ll try the Blues. 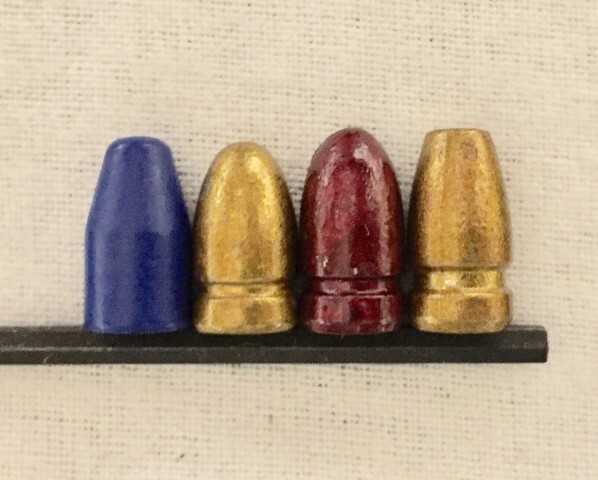 What is my favorite coated bullet? answer: The ones I cast and coat myself. No interest in FMJ? You can get them around $88 per 1k if you buy 2k. 1st 500 - Issues with follow up shots for an old guy - USPSA starts next week - Hoping these will help. Love them so far. Ran a Mag with 3x 115, 124 and then these 147's What a smooth shooter. M9 and a 1911 short barrel. , P220 - W.German 45, Sig 1911 45 Ultra Compact and a few others. A sample of Blues is on the way. My reloading components seem to disappear quickly. Yup. They make excellent boolits, with a lot of variety. The Blue Bullet company sizes theirs to .355, so I will see how they do. I’m hoping that the slightly smaller diameter and more pointed shape will be more forgiving with the CZ. XLT - You got my attention with this price. How do you qualify for the 8% discount? "Yes and no. We have been asked by many deserving individuals how they can obtain a discount. Police, Military, Firefighters, Competitive Shooters, Youth Shooters, Militia Groups, FFL Holders and more, are among those who contact us. We agree. You do deserve a discount. So, rather than dealing with the hassle of multiple discount codes and verification programs, we decided to keep our margins lower and offer a discount to everyone. This is why you’ll find great prices every day on our products. We aren’t flamboyant about this, we’re just regular people trying to treat our customers right." I've shot lots of BBI in the past and been very pleased with them. As for bulk bullets, I mostly shoot ibejiheads now. The prices are good, they're a big supporter/sponsor to USPSA matches and the owner shoots at our club often, so it's possible to get them delivered in person and save shipping costs. For me, Precision bullets. They are swaged for the same weight and geometry consistency as jacketed bullets and they have always been quite accurate. Their old coating has always been 100% perfect for me, but they have an improved on. They are hard enough for any 9x19, 9x21, .38 super and, if they made them, for the .44 Mag.